The Des Moines Register called Railroad Bill's Dining Car "the East Village's best-kept secret" in a very nice write up posted on its website on Wednesday. The Register article had good things to say about the simplicity, affordability and quality of our menu. Railroad Bill's "is the perfect place to have time-honored diner food that's fast, inexpensive, filling and delicious," the article said. The Register article goes on to detail the role of Railroad Bill's and neighbor Raccoon Forks Trading Company as Raccoon Forks businesses. Both businesses provide jobs and job training to individuals with disablities and other barriers to employment. "Plus, your breakfast or lunch goes toward a good cause," the article said. 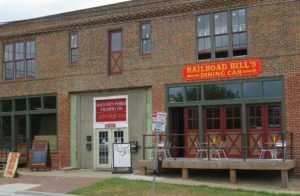 The article appreciated the atmosphere at Railroad Bill's created by our nearly 100-year old building (originally home to the American Railway Express Company) and our passion for historic preservation. "It still has its original wood floors, giving even more character to the already charming space," it said. We truly appreciate the exposure and kind words and want to thank the Register for visiting! We are pleased to announce Raccoon Forks Trading Company's fall sale event and the Grand Opening for our pals and neighbors Railroad Bill’s Dining Car on Saturday, October 13. The event will feature several marked down selections from RFTC’s carefully curated antique inventory. Railroad Bill’s Dining Car will provide the food and drink – including items from the new Railroad Bill’s food truck—and live music from some of the best up-and-coming local musicians. We are also recruiting other antique, vintage and arts & crafts vendors to sell at the event. If interested, please call RFTC at (515) 809-1715. 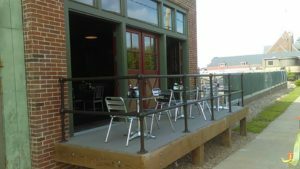 The new patio at Railroad Bill's Dining Car is open! 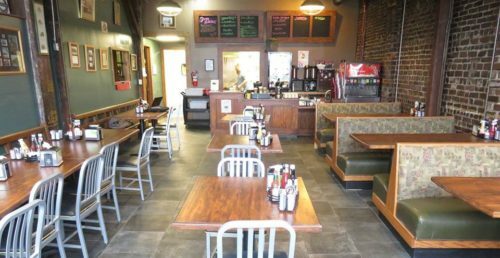 The patio is an excellent place to gather with family and friends to enjoy our classic diner breakfast and lunch menu and the pleasant spring weather. We are also happy to announce that we've added Sunday hours. Our hours are now Tuesday-Sunday from 7 am to 2 pm. Be sure to make a stop at Railroad Bill's part of your Sunday Funday plans!